Over the past week, 15 students from Charles Sturt University took part in the Intercollegiate Meat Judging (ICMJ) competition. The week was held at Charles Sturt University in Wagga Wagga and attracted students from 10 other universities from across Australia as well as international students from Japan, America, Korea and Indonesia. The week-long program included lectures from industry members, student training workshops, professional development workshops, a careers fair and the competition to wrap up the week. With the theme of ‘let the meat industry take you places’ the focus is to encourage and inspire tertiary level students to pursue a career in the meat and livestock industry, which over the past 26 years has been a resounding success. Consisting of students from Agricultural, Animal and Veterinary Sciences the CSU team showed their passion and dedication to the industry by training twice weekly, for a total of 9 weeks. This training consisted of theory and practical based sessions, which included visits to local abattoirs. The CSU team were successful at the competition, with Macky Lawrence being selected in the top 10 and will have the opportunity to be selected in the Australian team during a industry training week in Brisbane. Kate Sandford will also attend the training week, selected by her coaches due to her dedication and interest in the meat and livestock industry. Furthermore, CSU was the champion team in questions and reasons, and pork judging, with Madi Guan taking out champion individual in pork judging and Macky Lawrence being runner up. We would like the thank Irelands Angus for their sponsorship of the CSU team, for affording us this opportunity. It is great to see Corey and Prue investing in the future leaders of the red meat industry, we also appreciate their time during our recent visit to their lovely property. The ICMJ week has been an amazing opportunity for me as an undergraduate. I would recommend the ‪#‎ICMJ16 to every one! The contacts and speakers have been amazing. Thank you so much to all the hard working committee for making this happen and of course all the generous sponsors for allowing us this opportunity. Irelands Angus would like to thank all successful bidders and underbidders for their support at the recent Autumn on property sale. Congratulations to Keringa Angus, Lamaroo SA on their purchase of the top priced bull Lot 5 Irelands Kirribilli K113 for $50,000. COMMERCIAL confidence combined with seedstock demand pushed bull prices to a high of $50,000 at the Ireland’s Angus on-property sale. 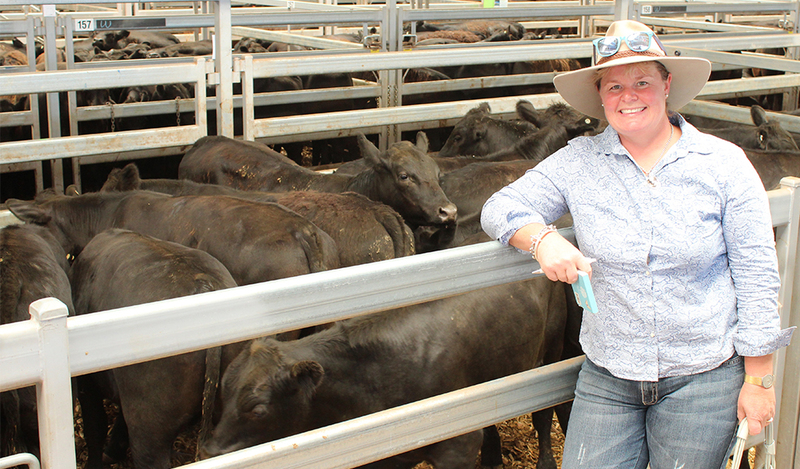 Stud principals, Corey and Prue Ireland of Kyeamba via Wagga are no strangers to dizzy-high prices for their cattle and were thrilled with the support. A total of 57 bulls went under the hammer to return an average of $6771 with auctioneers Joe Wilks of Elders, Wagga and Kevin Norris of Landmark, Albury taking the bids. South Australian cattleman and principal of Keringa Angus, Trent Walker bought the top-priced bull. A frenzy of bids came in on the phone but Mr Walker, who flew to Wagga from Tintinara, was keen to secure his pick of the catalogue. “He has a solid pedigree and I like his sire, (RAFF Dynamite D345),” Mr Walker said. In South Australia he runs a stud operation with 220 registered females and this complements additional commercial operations which includes a feedlot. “I have been using Irelands genetics for four years and I like the strong focus on the maternal side,” he said. Meanwhile, Mr Ireland said he was encouraged to see the support at the sale from commercial producers. He said it was testament to the stud to see the same vendors who regularly top the mountain calf sales in Victoria supporting the Ireland’s Angus genetics. March 18, 2016, 5:09 p.m.
Congratulations to repeat Irelands clients for their success at the March Mountain Calf sales. The Sharpe Fullgrabe Hinnomunjie sale saw long term clients, John and Nola Ross, Omeo Station, Benambra sell an outstanding and consistent line of 328 calves, topping the sale at $1270 for 10 month old steers. Omeo station also sold 10 month old heifers to $1150. Repeat performer Jamie Walker, Mountain Maid, Omeo, sold an excellent run of 150 calves to top the Elders Omeo Calf sale with their top pen of 11 month old steers for $1270. Mounatin Maid also sold 11 month old heifers to a top of $1130. Jamie Walker, Mountain Maid Station, Omeo, will send 200 Angus weaner steers and heifers into the Omeo Black sale. Breeding a consistent product to receive a consistent return is the aim of Jamie Walker, Mountain Maid Station, Omeo. Mountain Maid Angus weaner calves are by Irelands Angus bulls. Mr Walker has bred Angus cattle since taking over Mountain Maid in 2002 on a walk-in-walk-out basis. Moving to Irelands Angus bulls two years ago rewarded him with the second-top-priced pen at the Omeo Black Cattle sale last year. He runs 200 breeding cows and, rather than breed replacement heifers, he buys Angus cows sourced through his Elders’ agent Ross McRobert. That means the entire progeny – steers and heifers – of Ireland Angus bloodlines are available at the Omeo sale on Tuesday, March 15. “Using Ireland Angus bulls created quite a big turnaround for us – the early growth and readiness for the calf sales,” Mr Walker said. Bulls went out with cows on May 15 for 10-12 weeks, so calves range from 9.5-12 months-old at sale time. Cows were fed silage during winter, to maintain condition and graze the mix of pasture grasses and lucerne, with 30-35 cows to a 41-hectare paddock. Calves were weaned from January 25 to February 1, though many of them were naturally weaned as their mothers’ milk dried up. Mr Walker’s emphasis on preparation is supported by a feeding regime that was tuned to weather conditions under the brow of Mountt Hotham and the timing of the Mountain Calf Sales. “What goes in the mouth, goes on the hips,” Mr Walker said, quoting an old cattlemen’s truism. “We’re big feeders in winter – to maintain the cows’ condition during the cold and support her feeding the calf,” Mr Walker said. One of the Irelands Angus bulls bought by Jamie Walker, Mountain Maid, Omeo. The average weight of the first two pens of his calves at last year’s Mountain Calf Sale was 410kg and the top pen achieved $1090 – $10 less than the top price. He is tightening his enterprise – rather than cull dry cows, he instituted a spring-drop joining this year and talked about being prepared to offload cows that consistently produce calves at the lower end of finished weights. His commitment to Irelands bloodline endures. “It’s time to look a little bit harder at the types of cows we buy and maybe keep some heifers,” he said. South Gippsland dryland grass finishers were repeat buyers for Mountain Maid steers, often through Mr McRobert. “They grow out into a decent bullock, fit and healthy and with good doing ability,” Mr McRobert said. 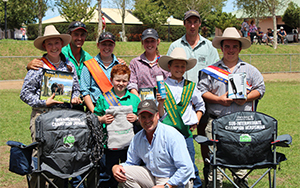 FIRST time entrant in the Beef Spectacular Feedback Trial, James Douglas, “Waverley Run”, Big Springs, was rather pleased to find his team of five Angus Hereford cross steers were placed tenth overall out of the 60 teams entered. “I was quite surprised our results,” he said. “I thought they looked good when they entered the feedlot, but you never know how they will turn out compared to the other cattle. Mr Douglas, who operates the 2830 hectare aggregation based at “Waverley Run”, Big Springs, east of Wagga Wagga with his wife Jacinda, said he entered his team of black baldy steers on the suggestion of his father, Les who has the neighbouring “Cheviot Hills” property. “Dad said, why don’t we put a team in to see how they will go, so he entered his Hereford steers, and I put my black baldies in,” he said. Mr Douglas said he thought it a good idea, to not only get some analysis of the performance of his stock under grain fed conditions, but if in fact, the cattle he is breeding are producing carcases are meeting the elite brand requirements efficiently. “I entered to give me an idea of where I was heading, to assess the value of our carcases compared with other breeders,” he reflected. Mr Douglas has been at “Waverley Run”, for four years, joining 800 cows annually in a split autumn/spring calving with sheep complementing the cattle operation. The steer progeny are grown out on improved pasture and supplementary fed hay to reach 400kg before sending them to feedlots. The calving is split to ease the workload, and to make better use of my bulls. The cow herd is split 50/50 Herefords and Angus with replacement Hereford bulls bought from Yaven Vale while Angus bulls are purchased from Irelands Angus. Mr Douglas said he meets the market when buying his annual draft of replacement sires, but admits to purchasing the best bulls I can get out of the top selection “without going overboard”. He started with Herefords and has stayed with them because of their temperament, and ability to always finish well through various seasons. 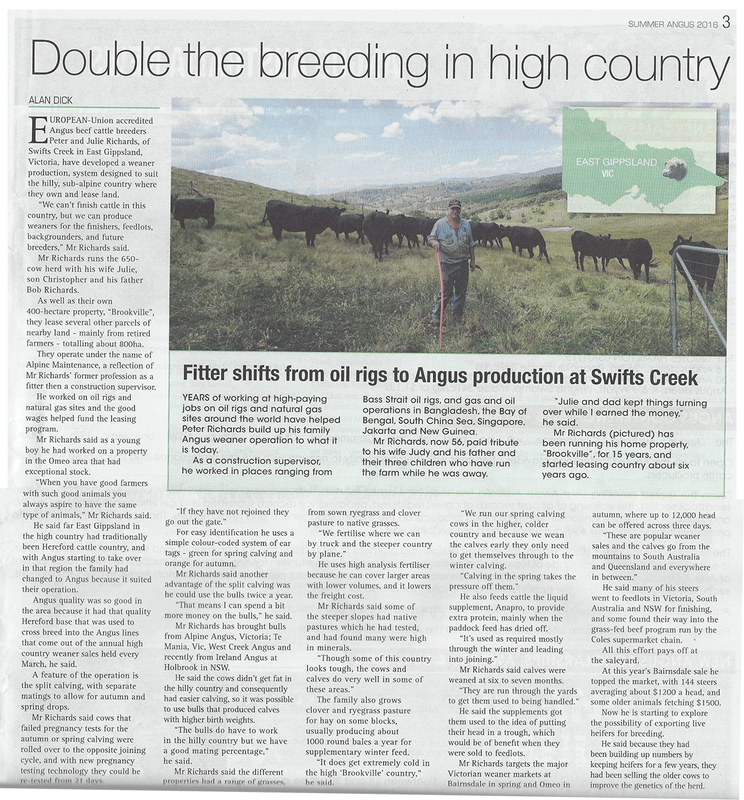 “I’ve seen my Hereford cow herd lift enormously in the past four years through the use of Yaven Vale bulls,” he said. He introduced Angus bulls “because that is where the money is”. The Hereford heifers are joined to Angus, and Mr Douglas said all the black baldy progeny always sell well. When assessing potential replacement sires, Mr Douglas said they have be “structurally sound”, and he looks at the 200 and 400 day growth figures, the fat cover and the Eye Muscle Area. “I want the index to be as high as I can reasonably afford,” he said. When classing his heifers, Mr Douglas said joining weight of 330kgs is the benchmark, and the heifers must have sound feet because his country is undulating and they need to go where the feed is. He is also strict on milking ability and ease of calving, and the Herefords must have eye pigmentation. Reflecting on the feedback information, Mr Douglas said he will be culling a bit heavier in the future to lift the overall standard of his cow herd. “Now we have built up our numbers, I can go a bit harder and clean up the bottom end,” he said. The results confirm Mr Douglas’s ambition to produce elite beef, and he will continue to “fine tune” his breeding and management program, lifting the standard of his bulls as he can afford them and culling his heifers to a higher standard. He also said it will be interesting to follow the various bloodlines through, and see if there were any outstanding genetic sources, or was his success simply the result of his particular hybrid cross. “I will enter a team next year to make sure we are the right track,” Mr Douglas said. “We got really good information we can now use to select bulls with indexes to help us increase our productivity. The story First time entrant surprised by success first appeared on The Land. By STEPHEN BURNS Feb. 10, 2016, 4:30 a.m. Starting off this year, at the recent Wodonga Blue ribbon weaner sale, Kate Parry, Glengarry Past. Co, Narrandera, reached the high sellers list, selling 10-11month old steers to a top of $1320 and 10-11 month old heifers to a top of $1025. “My breeding objective is to breed an even and consistent line of animals, buying bulls at Irelands allows me to achieve that goal. I can vouch for Corey’s guarantee and after sales service” Kate Parry.